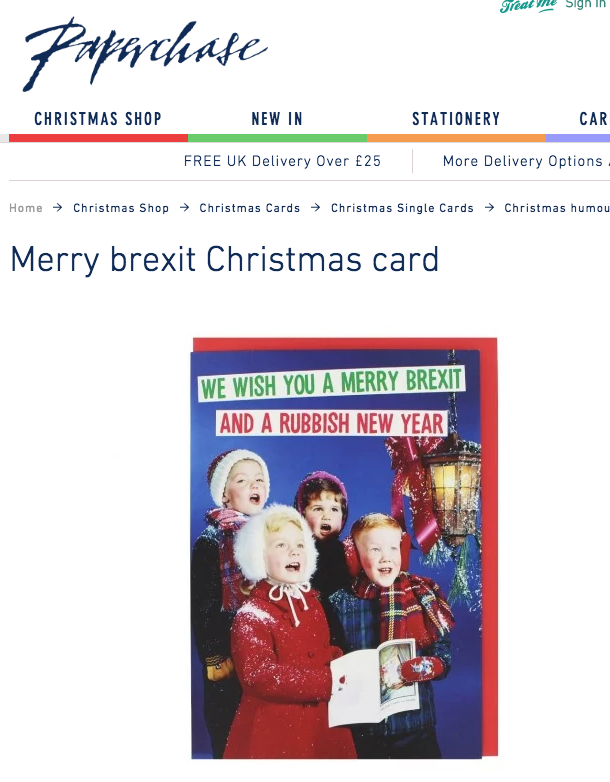 Have you boycotted Paperchase, sellers of printed stationery – yep, people really do still send letters (though not to Daily Mail readers who communicate by holding their noses and yelling into the wind)? Hope not. Paperchase tried its best to shine a light into society’s darkest recess. It reached out to the Daily Mail’s Untermensch readership, hoping that in offering them two free rolls of Christmas wrapping paper, they’d be put on the path to decency. But Stop Funding Hate thought Mail readers beyond salvation and bombarded Paperchase’s social media account with complaints. Paperchase didn’t rescind the offer, but did vow never again to reach down into the sewer. It was “truly sorry”. Some people are just not worth the effort. Wrapping paper is a not a right; it’s a moral choice. The tree gods gladly give up their own to wrap useful gifts like photos of Jeremy Corbyn, DVDs of The 100 Best Silences and the Pop-Up Book of Safe Spaces. But save for the odd Japanese knot weed and leylandii, no vegetation wants to be seen dead around the kind of stuff Mail readers buy at Christmas – jackboots, flaming torches and Jeremy Clarkson audio tapes. Sarah Baxter tells Times readers Stop Funding Hate is interested in muzzling the Press. The group’s founder, Richard Wilson, ‘admitted on Newsnight that “the end point for us is a media that does the job we all want it to”.’ Which is? Baxter says it’s “suppressing the array of opinion reflected in the British press… Stop Funding Hate, however, has morphed into an arrogant group of hate-mongering activists who are outraged about an ever-expanding range of subjects”. The idea is simple: starve the publication you don’t like of advertising money and watch it die. If this also deprives thick-as-custard people of reading the tabloids, all to the good. If those mouth-breathers can’t be banned from sharing views of the right-minded, their reading material must be censored. The caring Left knows best. Stop Funding Hate may legitimately urge Mail readers to quit (and Mail readers may, equally legitimately, examine the causes SFH espouses and make up their own minds). But trolling rather nervous companies such as Paperchase isn’t legitimate. It’s the thin end of a dangerous wedge – with no winners in sight, from left or right. As last week’s Ipso complaints ruling on Trevor Kavanagh’s “The Muslim Problem” column for the Sun mordantly observes: “There is no clause in the editors’ code which prohibits publication of offensive content”. Nor should there be. Usually, I am the sort of person who thinks that anyone who has ever worked for the Daily Mail is worse than Adolf Hitler, even the temps and the tea lady. And I’m not alone. So disgusted are youth voters by the repellent newspaper, it’s now clear that the Daily Mail’s increasingly hysterical attacks on Jeremy Corbyn, the coddled egg of British politics, may even have helped secure his triumphant loss in the last general election. I didn’t call for a boycott. And the sport pages are good. Boycotts are, after all, for censors and Nazis. Lee also turns to the subject of Nazis, riffing on when the Mail hailed the blackshirts. Haha. Got one about the Guardian opposing the creation of the National Health Service as it feared the state provision of healthcare would “eliminate selective elimination”? This is not to defend the Mail. It’s to highlight how censorship is formed by bigotry. Owen Jones disagrees. He writes in the Guardian: “Paperchase rejecting the Daily Mail is another victory against hatred.” No, he’s not being ironic. This paper, whose less than glorious history includes cheerleading for the Nazis and Oswald Mosley’s blackshirts, is one of the most vindictive bullies in Britain. Malcolm Muggeridge, was initially supportive of the Soviet regime. But then he went to Moscow as a correspondent for the Manchester Guardian and learned about the Ukrainian famine. The Guardian censored his reports. The left was divided by the atrocities of the Soviet Union into honest, moral people and those who turned a blind eye. Is this a row between newspapers: the Guardian in need of the Mail to showcase what it is not; the Mail and right-wing Press, doing much the same? The difference is, though, that only one side supports censorship.